We are Heather Roper and Ryan Dougherty, and we recently graduated from the University of Arizona. 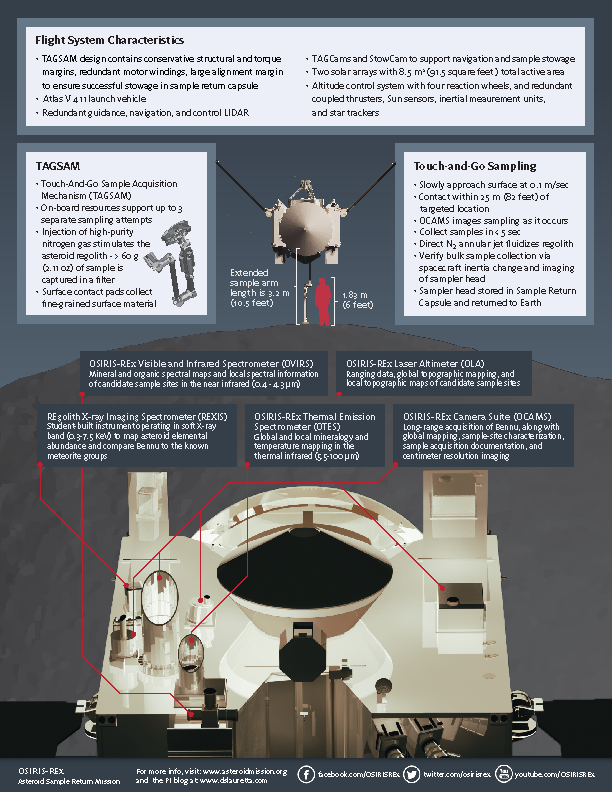 We served as graphic artists for the OSIRIS-REx Asteroid Sample Return Mission. We worked directly with the scientists, engineers, and mission management to learn about the mission and then worked to convey the knowledge we gained to the public in a visually compelling manner. A large part of our work revolved around social media strategy and developing projects to disseminate the science and ideas behind the mission to the general public via various social media platforms. As student employees, we were given the opportunity and privilege to work with a team doing new and exciting things in an effort to understand more about Earth and the origins of life in the Universe. Needless to say, it’s been an exciting opportunity for the both of us to garner professional experience while learning so much about the relationship of science and graphic arts. An example of visualizing data relevant to OSIRIS-REx. My name is Ryan Dougherty and I created various graphic design related projects for the OSIRIS-REx mission. Most of my projects involved taking information pertaining to the mission and making it visually interesting for the general public in the form of infographics. Infographics were designed to convey information quickly and in a visually appealing manner. One of my projects was the mission’s technical fact sheet. The fact sheet is an example of organizing a large amount of information in an aesthetically appealing and organized way that takes advantage of organized design and typography. It was a challenge I enjoyed because of everything I learned along the way. Working for the OSIRIS-REx mission has opened my eyes to the symbiotic relationship of science and design, and the professional opportunities that my experience with the OSIRIS-REx mission has prepared me for. 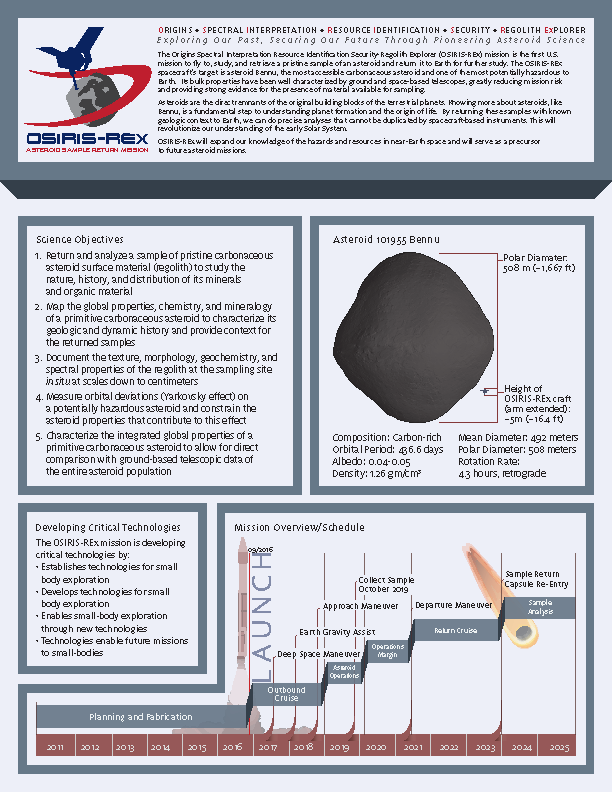 The OSIRIS-REx factsheet is an example of the benefits of design/typography. My name is Heather Roper and I worked on various graphic art, illustrations, and other miscellaneous art-related projects. As part of my position, I was often provided with challenges for which I had to develop creative solutions, yet not forfeit any of the important information contained within the message. In doing so, it’s important to ensure that the visual representation supports the original message and does not hinder that which it is trying to portray. Sometimes this challenge is more difficult than others, but I’ve always enjoyed the process of creating a graphic which successfully communicates a visual idea with accurate scientific information. 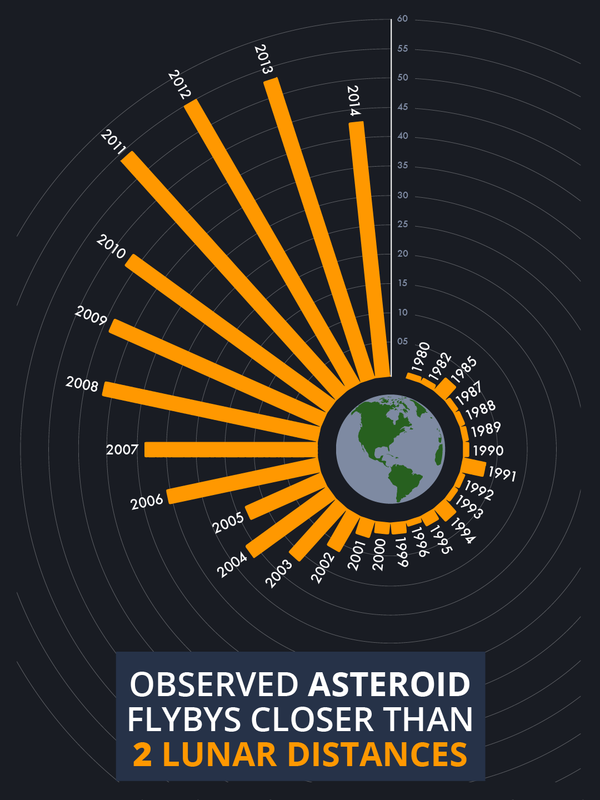 The OSIRIS-REx Asteroid Flyby graphic is an example of scientifically accurate data represented in a visually appealing design. My involvement with OSIRIS-REx was not limited to only creating graphics and illustrations. I also had the privilege of being involved with other art-related projects. One of these projects was painting a 3D printed model of the OSIRIS-REx spacecraft so that it would accurately represent the completed and assembled spacecraft. Due to the fact that the spacecraft is assembled in stages, I had the opportunity to learn about the various stages of the spacecraft’s assembly, as well as gain insight into the purpose and function of each of the instruments. After my research was completed, I was then able to use my skills as a painter to create a model of the spacecraft which is technically accurate and represents the soon to be assembled real-life OSIRIS-REx spacecraft which will journey to Bennu. 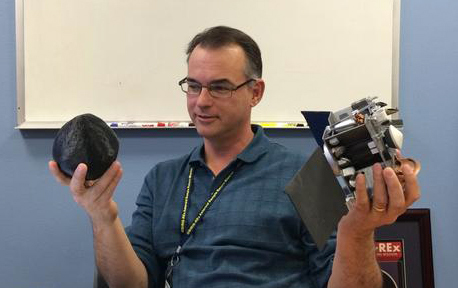 OSIRIS-REx’s Principal Investigator, Dante Lauretta, holding a model of the OSIRIS-REx spacecraft. I’ve always been fascinated by space exploration and learning about something so vastly unknown. It’s the same curiosity that drives my passion for scuba diving and exploring our oceans. There’s still so much we have to learn about something so prevalent, yet so foreign. Given my tendency for creativity, my academic career has landed me in the design field, rather than the sciences. When the opportunity to work for the OSIRIS-REx mission presented itself, I immediately jumped on it. It’s an opportunity that allowed me to learn more about something that fascinates me so much and that applies to my profession. To be able to do all of this before earning my bachelor’s degree was an opportunity I surely won’t take for granted. Although I can confidently say that I’ve been an artist my entire life, art was definitely not the only topic that I loved early on. I’ve always had a passion for science and continue to have an eagerness to explore the world around us and consume all the knowledge which I am able to. My interests don’t just stop there, but continue on to my current position at OSIRIS-REx, where the sky is definitely not the limit. My passion for learning made every day at work interesting, and I found that I constantly learned new things – which is one of the many reasons why I found my responsibilities with the OSIRIS-REx mission so very interesting and rewarding. My tendencies as a graphic artist often reflect an attention to detail, a preciseness toward portraying an object as life-like as possible, and devising creative solutions for the projects which are assigned to me. Working with the OSIRIS-REx mission while still an undergraduate student at the University of Arizona gave me an innumerable amount of experience and countless ways to use my skills in my profession. It was an opportunity that I definitely won’t soon forget, and I’m excited to have been a part of and continue to watch as the first U.S. asteroid sample return mission progresses on its voyage and sends a sample of asteroid Bennu’s regolith back to the scientists eagerly awaiting it on Earth. Thanks for the interesting and informative updates! Love this mission. Reblogged this on LACO Technologies Tech Blog. ← Celebrating the Small Bodies of the Solar System – i C Ceres!